Category Archives: I didn’t know how nice people can be until I got sick. I felt a lot better last week. I’m finally getting back into the Recovery Routine. Part of the problem was that I forgot that the stuff I brought home from Oregon was going to be here. But now I’m done crying over my piano, I gave away lots of purses, and I made Ai Ai take the jeans I was wearing when I got sick (thank you, Medical people, for preserving them intact!). It was particularly hard to see the gifts that poured in from my friends when my brain first bled. I was asleep so I didn’t see most of them until now. So when I pulled some photo albums I didn’t recognize out of a box I leafed through them in wonder. Some of them are annotated. J and A had combed through their archives and compiled a small album for me including the photo up top. J put notes on them, she said, because we didn’t know how much you’d remember when you woke up. Sniff. Turns out I remember quite a lot. If you want to know about my childhood just ask. If you want to know about your childhood or early adulthood (and we’ve known each other for a while), I’ve got you covered. I can remember a lot of ancient history but my brain often gets the hiccups and I forget what you just told me. Example: Last week I had a rough day at The Running Gym. I was doing an exercise while observing my form in the mirror. I asked Coach R if I should alternate legs. I got ready to start stepping, and then searched my mind for his answer. Booo! I clean forgot!! I burst into laughter because it was seriously like 3 seconds after he had told me but I had to ask him again. I had a 50/50 chance of being right. I should’ve guessed and assumed he’d roll with it. 10 minutes later I had another floppy brain moment when he was trying to tell me how many reps to do. I was thinking, Aaah!! Too many words! You’re talking too fast. Just fill in the blank: X sets of X. This is in stark contrast to the way things used to be. We hosted an evening event with a lovely buffet one night at my first job. I was in the lobby meeting the caterers prior to set up and I told my friend the security guard I’d make a plate for her and bring it down. My boss walked by later when I was already upstairs and asked if he could bring her anything but she said, No, thanks – Ning said she’d bring me something. My boss replied, Ning never forgets, and proceeded upstairs to herd the unruly mass of brokers (I worked in corporate real estate) into the large conference room. These days I forget things more than I like to admit. To compensate I’ve been trying to become more systematic in my approach to remembering things. I use apps on my phone, tricks I learned in Speech Therapy, Vision Therapy, and Business School, and when I really can’t remember something I go through the alphabet and think of related words until I find the right one. I probably cannot remember the instructions you just gave me, but I know many fun facts about the people who cared for me when I woke up: that your dog loves buttered popcorn; that you plant a gazillion zinnias every year; that the Fourth of July is your favorite holiday; that you hid the bubble solution so your 2-year olds would never know their Fisher Price “lawnmowers” could blow bubbles, too… But it’s these little pieces of information that make up life. And the fact that I somehow absorbed these facts made me feel like a part of the normal ebb and flow of things. The trick is to make the leap from passive observer to active participant. Yeah. I’m still working on that. One of the hard parts about this is that sometimes I remember things I think I’m alone in making a note of. It’s the concept of how the world keeps on turning although yours has stopped. I celebrated 3 years at home yesterday. Technically, this is not my home, although I grew up in this house and I love being with my parents. I had a home. I paid for it with my salary. I invited friends over. I cooked things and served them on blue and white Spode platters. I made appalling window treatments (they really were appalling – ask Mommy). I sat on my patio and read. I was happy there. But I never saw it again, and I never will – it doesn’t exist any more. I took a break while Mommy and Daddy were sorting through my Garage in OR and snuck over to my old building to say goodbye. It was too far for me to get close but it’s just as well. I didn’t want to go too far in case they got worried. My life is very much in a forward-facing mode now but I will always feel a sense of loss and regret when I think of where I used to live. I am very grateful that my parents rearranged their Empty Nest for me and spend their days shuttling me around (<3) but sometimes I miss my Old Life. I always will. That’s why I doggedly celebrate these anniversaries – because sometimes if you don’t laugh you’ll cry. Yesterday, someone else remembered. A friend gave me the sweetest gift to mark the occasion of my homecoming. I didn’t fully understand at first because of my hearing loss, but when I realized what was happening I was deeply touched. Thank you for remembering. It was just the hug I needed. I made this picture for Boo Boo. I love how the cupcake is winking at me. Trainer D often demands, Did you have a good breakfast? and What did you eat? One day I replied sweetly, A cuppy-cake [smile/lopsided grin], and then I was gonna have some oatmeal but I skipped to the brown sugar – straight up out’the box. 🙂 FYI this is how I roll 80% unfiltered. I assure you I was a real treat to work with right when I woke up and was 99.9% unfiltered. Around that time at RIO (3rd Hospital), a friend visited and slid a 3-pack of my then-favorite gum on my nightstand. He showed me the ropes of A/V duty at church and one Sunday we had to be there early to set up. Neither of us had eaten breakfast so I gave him some gum (Trident Stripes – strawberry/orange). That’s right, T, I said, Breakfast of champions!! I didn’t know if he was real at that point in my hospitalization but I recognized my favorite gum and I appreciated that he remembered what I liked. A favorite part of my Oregon trip was communicating to people that I remembered details of my Old Life that they had had a part in, and to express my appreciation. The first person I saw at RIO (3rd Hospital) was not one of my therapists – it was the Resident Hair Braider – the OT routinely enlisted to braid patients’ hair when occasion required. On the morning I flew home M (OT3) summoned her to French braid my hair for my homeward bound trip. When she entered my room I greeted her – Hi, A. You know my name! She was impressed bc I’d only seen her a couple times before. When I saw her in April it was my turn to be impressed. I saw the back of her head as she disappeared into a stairwell but I called her name in a questioning tone. She took one look at me and instantly remembered. This was notable since I had not been her patient and I looked very different when I stayed there. Let’s just say that the transition from bedridden to not bedridden was a rough one on a whole lot of levels. After three years I was able to tell her that her braid had lasted all day and night – after the trip my family had somehow managed to get me inside the house and into my downstairs bed (I was still wearing my airplane clothes and hair, but was so wiped out I didn’t care). One of the ways I steeled myself for the trip was by telling myself I needed to go to my hospitals in order to thank people. A lot of thank-you’s remained unspoken – e.g. thank you for saving my life, for teaching me to sit up, for being kind to me when I was afraid, for believing I’d wake up even though it didn’t look too good at the moment. But the thank you’s I did say, like for that fantastic French braid, and to my friends from work and church, were heartfelt and I hope my peeps were glad that I remembered their contributions to my Recovery. These days I’ve started hanging out with people who belong on the front of a Wheaties box. Well, maybe not CMD. She’d be on a box of chi-strengthening herbs. But it’s not their Wheaties-candidacy I value the most in them. True, the nature of my injury (its severity and the opportunity to recover) requires a sky-high skill-level (or it could just be that I’m picky, but whatevs), but I’ve found (note: in my individual experience) that personality fit often trumps specificity of training. While I recognize their professional expertise it’s the small things outside of their job description that offer me the healing touch of human kindness. Although I’ve worked with absolutely fantastic neuro specialists in the past the common denominator among the people I’ve worked with successfully is two-fold: 1) They know how to laugh, 2) They are nice. I’ve learned that I have a greater chance of getting what I want if I present my credentials in the way I wish them to be interpreted. Hence the posturing of RecoveryLand. I’ve been told that one of the biggest differences in my post AVM personality is that I used to be all about the presentation. (Apparently I was able to exert an incredible amount of self-control then.) My instinct is to still try to present myself as strong, capable, ready for action, etc. since this kind of attitude invites a higher level of rigor, but sometimes my body parts don’t cooperate – I have a motor skill malfunction or my tremor chooses an inopportune time to distinguish itself. I know from experience that an Occupational Therapist would sit there until you complete the task. But these people, who do not hail from the (acute) Rehab world, see my weakness and intervene. They don’t make a big deal of it – they don’t comment at all. And I’m so busy trying to cultivate a certain image (Let’s get to work, people – there’s no time to lose.) I don’t have time to be self-conscious when a deficit highlights itself. But in the same way that I appreciate when other people remember my preferences I will always remember these small acts of kindness and think of them as proof of your skillfulness as a professional and as a person. I looked longingly out of my window in the direction of DnA’s apartment (we stayed in the same neighborhood) and the week was packed full of medical and social reunions. One of the only times I really cried was when I saw L. A while ago I sent a “save the date email” for my Intel “Hello” Party to my manager to circulate, and within 20 minutes the email had made it from Oregon, to Texas, to California, where L resides and she immediately messaged me and said she was flying up to Oregon to see me. (Side note: thank you so much to my Intel friends who were able to come out to the Hello Party, especially since it was Close Week!) When she got out of the car it was like no time had passed – I was so happy to see her! She helped us sort through my storage garage at my old apartment complex. As soon as she arrived she aligned herself with Mommy and they both ordered me to stop poking around and just sit in Red (my wheelchair) and they’d bring boxes to me. Overall, Mommy said I held it together quite well. There was plenty of choking up, but I got most of the ugly crying out of me before we flew West. The only time when I was really going to lose it, but held on tight, was when I saw the guys from my Oregon church in their trucks ready to haul away my stuff as we prepared to empty out my garage for good. Gathering manpower was as simple as sending one email for me. Good thing, bc I can’t do much else. I sent that one request for help, and they were coordinated and mobilized into action at the appropriate time. Tanpo acted as the point of contact on our side(I avoid talking on the phone bc of the speech/hearing issues) so it was great bc I just had to show up. Not really, actually – I didn’t truly need to be there. I was more ornamental than not. It was like when I first moved to OR, and when I got sick. This was another example of the body of Christ functioning in top form. CMD always plays relaxing music in her office. When I first started acupuncture I was going 3x a week and could anticipate every song on the CD that was then in favor. Lately we’ve been enjoying what I think are folk tunes from around the world. A few days ago I said, “I love this song!” as CMD was getting some equipment ready. It was Simple Gifts – the classic 19th c. American Shaker song made famous as the theme in Aaron Copeland’s Appalachian Spring. My very American childhood had this song occasionally playing in the background, and I think I also learned about it in a music class in college. It’s a very “Americana” sort of tune that’s hard to miss if you grow up in the States. CMD did not grow up in the States so she had no notion of the emotional connection I feel for the familiar melody. It was a very strange feeling for me to recognize something that someone else doesn’t. It’s usually the other way around in my new life. I often have delayed reactions and my mind will be clicking and whirring away if you mention something – I’m trying hard to remember, did that happen before or after I got sick? Did it really happen in the first place? Does that apply to me any more? I flatter myself that these internal musings are not prolonged enough to attract a whole lot of attention, but they happen all the time. If I’m having a really floppy moment I’ll pause the conversation and ask for clarification, otherwise I try to carry on as usual. Carrying on is what I do every day. This train’s not a-stoppin’. But as I try to move full steam ahead simple gifts can make me stop in my tracks. I said a few weeks ago that I try to maintain a “game face,” “tough,” exterior – but the kindness of these gestures catches me off guard and I can be a bit of a sissy about them. When I first woke up I was in the mindset that this might not be real anyway, plus the adjustment was so vast and the change was instantaneous (I don’t count the time I was asleep) that I was ready to spare no expense and secure every convenience. Now I understand that I’m in this for the long haul and I recognize the parameters I must live within. This new mindset aims at making my environment in RecoveryLand functional – comfort is a highly valued but often secondary concern. I’ve received some things from people who have bypassed my criteria and gifted me in ways that attend solely to my comfort. These are not necessary items, these are extras that make my days happier and more enjoyable. To be the recipient of such generosity is always surprising to me. RecoveryLand can be a rather Spartan-looking place since the fewer items I possess the fewer items I have to learn how to use properly and clean. I know – if you know me you’re probably like, that’s a FEW?!?!? But in comparison with my Old Life I’ve pared down a lot, I promise. I’m primarily concerned with making RecoveryLand a happy place. You don’t need a lot of things to laugh. But when people take the time to make RecoveryLand a more beautiful place I am taken aback. I recognize this kind of thing from the scenery of my Old Life. Could this be for me? Now? Yes. You chose it for me because I wouldn’t do so on my own, but you knew it would make me smile. Thank you <3. 255. Seriously, Could you HAVE any more friends? Apparently a high volume of visitors is not the norm, and the fact that so many of you came to pray in the waiting room (when I was still quarantined after surgery), and came to see me when I was well enough was a circumstance that pointed to the conclusion that “something’s different about this situation…” to onlookers. Some friends even flew from MD to OR. I was too asleep to enjoy JLSS and JPAS (I knew they were there, though, bc I heard JLSS’s voice and dreamed that JPAS was the VP (of the United States), but I was awake for J and KAR. I recently asked J to tell me about their arrival since I don’t really remember it. They arrived right after I had face-planted in a major way since I thought I could still walk. When I saw them for the first time I was rolling by in a wheelchair and I raised two fingers in front of my eyes and then gestured to them like, That’s right – these eyes are watching YOU! And when they saw that they were like, Yep, that’s her all right. She’s gonna be fine. I didn’t know they were really there. They had both visited with me in my Old Life at separate times over the prior year so I just figured they were part of my dream. I supposed it was a little strange that they had to wear yellow gowns and purple gloves around me, but I was willing to overlook many oddities in order to believe everything was a dream in those days. J told me I was very nice and always polite, but was like a distant version of myself. I believe that. I can remember my therapists talking with me sometimes – you know, regular conversational stuff, or funny things that just came up – and I could hear their voices and knew what they were saying, but I had a very delayed reaction. It was like they were calling to me from another world, and I heard the content of their speech, but did not recognize myself as part of the social context they were operating from until about 5 seconds after they said it. They were always nice and we carried on the conversations semi-normally, but I recall several instances of me just staring blankly in my chair until I rallied my wits enough to interact with them. Now the “distant” days are over. One day M (37) apologized for getting all up in my space as she buckled me into the Zero G harness. “Oh, no, M – it’s fine – I used to live in the hospital!” I’m fully awake now so I’m prepared to engage like I used to. I’m not that distant version of myself anymore – this is “me” in living color, and with a greatly reduced social filter! Fasten your seatbelt. PS. Remember that in order to be a beneficiary of the body of Christ functioning in top-form (loving one another), you have to be a known member. 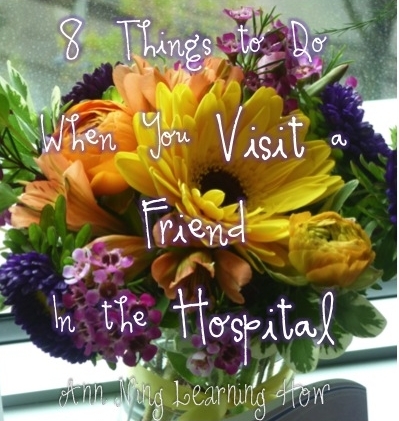 Last week I wrote “8 things to do when you visit a friend in the hospital” – I’m glad I did because some people are interested in this (from my search engine referrals). 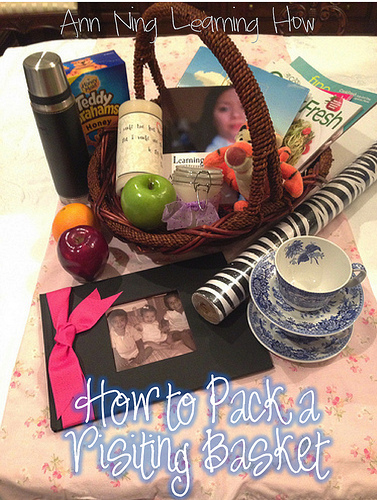 This week I’m writing about how to pack a “Visiting Basket.” Actually, it could be a paper bag, a cardboard box, whatever – baskets were affordable and easy to carry ; although if I could carry things now I would have probably upgraded to one of those nice collapsible shopping baskets you can tote to the supermarket. Use whatever is convenient for you. The VB (Visiting Basket) is useful in many contexts, so this post is about any kind of visit – not just hospital-based. There are 2 main visit types: (1) The Illness Visit – if your friend is sick; setting = any medical facility or at home, and (2) the Friendly Visit – this is the kind of visit I’d indulge in when I had the (partial) day off or an available Saturday. I say “indulge” because it’s fun to go visit your friends. This is a happy fringe benefit. Just remember, though, that the primary goal of any visit is to focus on the person you’re visiting. You’ll need to practice your people-reading and conversation skills, though, since often times a sick person wants to talk/think about something – ANYTHING – except illness, but you also want to give them a chance to express their feelings on the subject if they wish. Be a good listener, but be prepared to gently guide the conversation (making them laugh is always a good tactic) should it start to get too Eeyore-ish (woe is me – I’ve got the doldrums). Good listening is the primary rule in Friendly Visits, too – setting = at home, a restaurant, or at a friend’s place of work (verify appropriateness beforehand). Use this time to catch up on what’s going on – all the craziness of running a home/earning a living – and you’re there to offer a bright spot in a hectic day. Just be aware of the periphery – things might be going on in the surrounding environment that require your friend’s attention – let your friend go attend to (mini) emergencies without feeling any angst over not attending to you, the guest. You want to be an encouragement, not a hindrance. I’m writing this even though this stuff seems kind of obvious since I think visitation might be a bit of a dying art. Visitation (I’ve heard it referred to as “Care Work,” too) was definitely a learned behavior for me. I learned it from my Mom and “Grandma” and my visiting practices were made easier since I have no family to care for and could direct my time independently. But remember, I learned how to do this from women with family/home responsibilities. Apparently it’s more than possible – it just might take some additional ingenuity and logistical planning. Finally, the art of Visitation is gender neutral. I approach it from a feminine perspective, but I remember J(&O)’s brother, S, as being a prolific visitor – and he was only in our area for a few months, if I recall. Well done, S! But perhaps you know no one who “visits” in your community. So it’s up to you to start – you can do it! It’s worth it. I had no idea this would happen to me, but the relationships I built through many years of visiting (just hanging around with my friends, really) were the reason dear ones dropped everything and flew across the country to see me when I got sick, and I found out that many more people had my back as they reached out to their networks to ask their friends to pray for me. (Thank you xoxoxo.) Even in the absence of such extreme circumstances, visitation is a good skill to have since it’s a practical mark of good friendship, and sharpens your “people touch” as you learn how to listen/respond/interact, which is something always desirable in a management position at work, and also just getting what you need done at the office, at home – anywhere. So if you’re new at this, recruit a friend to help you think of things to bring/say. You can tell your friend his/her job is to help facilitate conversation, and then go for it! The more you visit the more natural it will feel – and if you recruit another visitor you just raised the “easy” level a few notches. Goal = not to feel like you’re paying a formal “visit” – you’re just going to go see a friend. 1) Decoration: There might be rules to observe if you’re going to a hospital, e.g. fresh flowers were not allowed in the ICU when I was there. 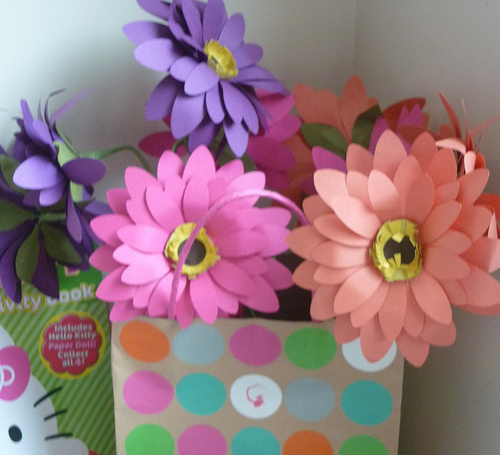 I received a gorgeous paper bouquet from my friend S and her little sister, D, also a brain surgery survivor. There is usually a bulletin board in the hospital room, so you can cover it with fun wrapping paper. If you’re going to someone’s home, a gift like a candle-wrapped flameless pillar would be nice and easy. One of these would also be cheerful and safe in the hospital. 2) Music: Sometimes words fail but music can help. Try keeping an old mp3 player loaded with nice soothing, encouraging music (nothing too rowdy, please) that you can bring to your friend if in the hospital. Clean the unit, especially the earphones/buds at home and assure your friend it’s been sanitized. If you have a portable mini “plug ‘n play” speaker, bring it. Leave these items with your friend, if possible. Just make sure it’s something you’re comfortable leaving at the hospital for a few days. Your friend will likely store it in a drawer, but it probably won’t be locked up at night, and in any situation there is always a risk of things being lifted. So assure your friend that it’s fine to store this stuff in a drawer (you don’t want to stress them out by making them guard your equipment), and also make sure they know how to work the player and are not intimidated by the technology. Side note: I have been bidding on old iPods for this purpose on eBay for MONTHS. The problem is twofold – A) I’m cheap and B) my brain is foggy sometimes so I can never remember to swoop in at the end of an auction and win the bid. Oh, well. When I do get some I will load them with public domain songs, things I’ve gotten from Amazon or iTunes, sermons I’ve found helpful, and of course an audio version of the Bible – amazingly available free of charge. 3) A Picture Book: Sometimes reading can be too taxing on the eyes, but a large picture book is safer. The patient can peruse while alone in his/her room, and Mrs. R told me once that her nurses really enjoyed the book I had brought her, too. I think it was either a pictorial history of the dress, a discourse on the House of Worth, or a coffee-table book of the evolution of the Princess of Wales’ wardrobe – whatever it was, it was easy to look through, and I’m glad it was a starting point for the nurses to talk with Mrs. R – who is always personable and charming, but it’s always nice to have a ready topic at hand. You could also bring a small photo book. A long time ago I visited Mrs. MA’s mom, Mrs. P, with RSKL and she brought a little photo album for show and tell. It facilitates conversation and is an object of interest – just be sure to bring a relatively small album or book so as not to overwhelm your friend. Side note: I did not have the opportunity to know Mrs. P very well, but I wish I could have known her better. She was the driving force behind the organization of our Sunday School back in the day, and understanding that people older than you have done lots of interesting and important things is an excellent reason to encourage young ones to learn how to visit. 4) Reading Material: You can bring real books or magazines for your friend to read, or you can read aloud to them. Put your thinking cap on and consider their preferences as you make your selections. 5) Snacks: I received many lovely baskets and food items during my inpatient life. A standout gift was the birthday basket J&O sent me. There were lots of nice treats, but the fresh fruit was literally a dream come true. (I had been dreaming of the fruit pyramids in P&P when I couldn’t eat yet, and I was desperate for some fruit.) Fruit is refreshing and a good option – just be mindful of dietary restrictions, e.g. sugar, acid. If there are no allergies, nuts are good, too. If you’re going to go all out, bring baked goods – I would do this more often in a Friendly Visit. You can always give your friend the little box of cookies/cupcakes and it’s up to them to consume them later, but it’s more complicated in the hospital because you want to bring “healthy” things to the hospital, your patient may or may not want to eat “healthy” things, and family members/caretakers might disagree with your definition of “healthy” – so be careful. But I mention it since food is always good. 6) Tea-time: I used to wrap a couple of tea-cups in a dishtowel, stick a thermos of piping hot tea in there, and show up in different contexts with a party. You didn’t even have to add water – you just needed a place to sit. I transported cream and sugar in little containers. (Include spoons for stirring.) This might seem a bit fussy, but I like china and teacups, and will use proper china at every opportunity (even if it’s a stretch). I also knew that when I visited I was often inserting myself into my friend’s busy day, and it was an effort to take a break and see me, so I figured it was worth the effort to pack the teacups to signal that I appreciated visiting with them and considered it a special occasion. I don’t remember ever bringing teacups to the hospital, but I did bring teacups to the doctor’s office waiting room and to the workplace (e.g. sometimes I’d go see my teacher friends at school). The logistical key to this is the packing – use dishtowels you’re okay with getting tea-stained, and plan on doing laundry when you get home. Choosing a more robust teacup (I’m partial to Spode blue and white, NOT cranberry, Mommy) as opposed to transporting fine bone china might ease your anxiety. Alternatively, pick up some fun pieces from Goodwill – they could either be fancy or everyday dishware – just choose something with a saucer. 7) Grooming Items: If you’re visiting a friend in the hospital, hair/nail needs might require attending to, if you’re both comfortable with that. (I would not recommend cutting anything unless you are a professional.) If you’re visiting a lady who likes colored polish you can get polish in the appropriate “Awareness” color. You’re less likely to do grooming activities in a Friendly Visit, but some sugar scrub or nice-smelling lotion is always a lovely gift. PS. I got so distracted by “How to get a heart ‘transplant’” yesterday that I forgot to tell you that my Vision Therapy graduation went well. Everyone was as nice as they always are and I only cried a couple of times (in private, at home). This was a vast improvement over the last time I was discharged from therapy. To celebrate I practiced the piano by playing from the hymn book this morning. If you missed Part 1: activity-based visiting is an easy way to start! I woke up at about 2am last Monday amazingly thirsty. I didn’t know it but it was the beginning of a fever. I didn’t call Mommy to ask her for a drink until around 3am since I lay in bed for a while hoping the thirst would go away. It didn’t. It made me think of when I was in the ICU and I was incredibly thirsty but couldn’t tell anyone. They couldn’t give me anything to drink anyway – I probably already had some tubes sticking down my throat and was disallowed from swallowing anything, but I was not overtly aware of these things. I only had some fleeting moments of partial wakefulness and just knew I was thirsty. When I came home from Intel Summer Camp (my internship) in August 2008 I stopped by Joe’s Shoe Repair to visit with the S’s. Uncle Joe immediately led me outside so I could see the display window as if I were passing by and made me select a handbag to commemorate my homecoming. “This one good…This one no good…” he advised me. I put up a little protest, but Uncle Joe was a very determined man, and I eventually selected a little LV with short handles that I’m happy to report my woefully handbag-challenged sister carried on the Sunday of her 2nd visit to Portland. Once inside I broke the news – I had received a full time offer and had to decide whether to move to OR. Aunty H claims she has no recollection of any such conversation (“Who say you can move to Oregon?”) but she was right there, I promise! I used to tell her that “Uncle Joe said I could.” When I thought I was moving to Africa I got into trouble again and could not claim that I had Uncle Joe’s permission. I had to ask ProfJ, who had assumed responsibility for the Sunday taxi service, to run interference for me on this one. But now it’s a moot point. Anyway, Uncle Joe really did say I could move to Oregon if I wanted to. He was very clear with me, though, that I would be largely alone out there if I did. If I got sick, for instance, “Nobody’s going to bring you a cup of water.” His example proved to be a powerful one. It sticks with me even now. The day before my brain bled I had stayed home from work. It wasn’t a cold or anything, it was just the overwhelming desire to sleep. I remember beating myself up over working from home. Surely, I reasoned, I was well enough to go to the office. I had almost coughed up a lung in Africa and the J’s had to take me to a pharmacy one night where I purchased (with JJ interpreting through the iron bars) something called “Muco-Mist.” Now a little tiredness was sidelining me in stateside comfort. Given what happened on Thursday I’m willing to give myself a reprieve on staying home on Wednesday. Uncle Joe was right – no one brought me a cup of water. But when it really counted God saw to it that I went to work the next day and a whole bunch of people were around to bring me anything that would help. Most importantly, they brought me to the hospital. Example: the two ladies who helped me when I collapsed in the Ladies’ after ditching my manager in the hallway “happened” to be members of the “Emergency Response Team” so they knew what to do, and how to do it fast. Now in case you’re wondering why I felt compelled to get the S’s permission to move to OR, they sealed the deal as my adopted grandparents several years ago. I was sitting in their red Jeep one Sunday when Dad was sick. I was sad so I cried a bit. “No cry, no cry!” Uncle Joe told me. But Aunty H smacked his shoulder. “Joe, she want cry, let her cry!” she said. I have loved them ever since. Mommy brought me some nice ginger ale when I woke her last week. Thanks, Mom! It was so nice to be at home and to get help when I needed it. But it turns out that help was around when I moved away, too. On the first Sunday I was in OR, two people (brothers) told me separately that if I needed any help moving I was to call So and So, who would activate the phone tree or whatever system they have, and people would show up to carry boxes for me. It turns out that I never called them to help me move, but somehow they were mobilized via phone or email when I got sick. I was asleep at the time, but now I know that when my family arrived in OR they were immediately shuttled to the hospital and hotel, and they would have been inundated with delicious meals had they been in more of an eating mood. So Uncle Joe was right – no one brought me a cup of water. But so many people brought me so much more. Mark 9.41 For whoever gives you a cup of water to drink because of your name as followers of Christ, truly I say to you, he will not lose his reward. I was going to take a picture of the Valuation textbook, but I remembered it’s in storage in OR. I decided on this one instead. During our 2nd year of B-school, E|B told me she had been talking to one of our friends (a real smarty) and she had mentioned she had been reading an interesting book called Valuation. We laughed because our friend’s recreational reading was the textbook for our current Finance course. I was an English major as an undergrad, which comes in handy now since I write a lot, but before I got sick, I was thrilled that Business School taught me the skill of valuation and that Corporate America is willing to pay people like me to attach dollar amounts to the value of a product or service. I told PT6 once that if he invented a pill that would make people walk without actually…you know…walking, I’d run his numbers for him and ideally he could retire early while beefing up his sons’ College Fund. (I had requested some sort of walking work-around once, but was told that there was no way to learn to walk except actually doing it.) My offer still stands. I no longer build models that represent value creation – I just do it in my head now. Unfortunately, a spreadsheet would probably help since I just realized that I’ve been unconsciously specializing in value depletion for 30+ years. Specifically, I’ve devalued the input from my left eye since birth. FYI, I’ve had a “lazy” eye (the left one) since I was a baby, and have largely ignored its input since the corrective lens in my right eye is much less drastic, so the image is therefore larger when I look out of my right eye. The fact that I’ve unconsciously turned “off” one eye’s image has worked in my favor since many people with injuries like mine suffer from double vision, but I don’t (I just have other issues, but am so thankful that double vision has not been added to the list). I’ve been working on an exercise at VT that involves wearing some special lenses that allow you to “see” double. One of the images is smaller than the other one for me, but I’m supposed to recognize them both as “real.” I know it sounds like a simple concept, but it’s a huge paradigm shift for me. I’ve dismissed my left eye’s image for my whole life as inferior and not worth paying attention to, but now I understand it’s an actual representation of reality and I should stop ignoring it. I have been blessed with two eyes that both function at some level – a pretty high level, relative to what I’ve seen lately – and I’d like to use them. To be clear, I was never unhappy with the way I saw things in the past. Sure, I couldn’t hit a baseball or park a car well (these things are much easier for those who have appropriate depth perception), but I had some other skills that made up for these deficiencies. It’s just that I’ve lost a lot of abilities since my brain bled, and the idea of using both eyes better (as opposed to just bringing the one I used before I got sick back to its baseline) is pretty astounding to me. 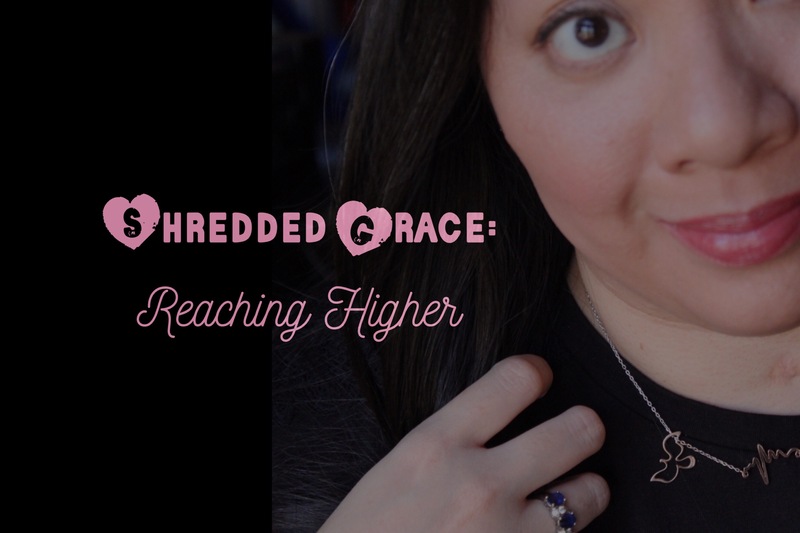 This would not be just regaining what I lost, although I know regaining what I’ve lost would be more than many others receive, this would be a truly additive gain – and I’m really into additive gains. Even if I do learn to use both eyes together, I may never hit a baseball or park a car well (or unwell), but I would still be able to do things (see in a manner) I couldn’t do in my old life. My test results indicate that my left eye is “waking up” in a manner of speaking, and I’m trying to pay attention to it more during Therapy, but the mere realization that my left eye’s input is truly valuable is the foundation of my big change. It makes me think of how many things/people in my life I’ve devalued. Now that I’m in a position to be a bit of a sideshow in public, it’s hard for me not to imagine what people are thinking when they see me. I once asked Mom if she thought people were laughing at me, and she said, No – of course not. If anything, they want to help you if they can. I surmise that there’s a huge discrepancy between how much time people spend looking at/thinking of me versus how much time I spend thinking of myself, but I think Mom’s right – when people actually talk to us in public, it’s usually to offer assistance. I know their courteousness must be somehow rooted in pity, but hey, the Psalms confirm that I’m a “poor and needy” person, and these strangers’ manner is always polite and I honor their desire to speak up and help, and confirm the fact that yes, I often need it. It’s these little gestures that remind me that I’m disabled but also that a little bit of kindness stirs the fire of value-creation into a warm blaze. Like today, at PT – we were doing manual strength testing and I was lying on the mat. PT37 has a student (an intern?) hanging out with us on Tuesdays, and we were practicing strength testing in preparation for her exam this week. Apparently you can test hip flexors or something either standing up or lying down. Of course, I voted for lying down. So I got pushed around while lying on the mat. I was wearing the gait belt in preparation for the balance testing that followed shortly thereafter, and my shirt was getting bunched up under it. I couldn’t see who was doing it, but my shirt got adjusted nicely a few times so I was decorously arranged while lying there. Thank you! When I was too unaware to notice things like the arrangement of my shirt, Mommy and J have informed me which PT’s were especially good at remembering to adjust my clothes for modesty’s sake. I know PT’s see all sorts of things in the gym, but the little courtesy of shirt-adjustment is so valuable to me. It reminds me that yes, although we are in RecoveryLand, there are guidelines to be observed and as a member of humanity, these guidelines apply to me even though I almost fell on top of you just now. I know they must teach you how to stop someone from falling in PT school, but I suppose the shirt-adjustment thing is something you learn on the job – it’s one of those small gestures that gets translated into every day life without any loss of value. It’s just an instance of someone looking out for someone else. FOMO = “Fear of Missing Out.” I learned this term from a friend who used it in reference to one of his children (a toddler), who is exactly like his aunt was as a child and harbors great anxiety about missing a funny part of a conversation, or a social event – anything, really. I think it’s hysterical that history has repeated itself in the family’s lineage. Later in the week after this term, I read about it in Time magazine at the Doctor’s office. The author was explaining FOMO as it relates to Facebook. You go online and see pictures of all your friends…wait – is that a bbq? Why was I not at that bbq? That is FOMO. I don’t have a fear of missing out, it’s just a fact that I did miss the greater part of April and May 2011, and June is a bit of a blur, too, but there were more moments of lucidity then. I have thanked the kind people who sent me so many nice notes/flowers/gifts, but I wanted to do it again. I still haven’t seen many of the things that came in the mail since they are packed away in my old apartment complex, and those things that I have seen I’ve only seen via photographs since I was asleep when they arrived in real time. Do you see the beautiful bouquet on the “Updates” page of my site? I thought they were gorgeous in the picture but never got to see them in actuality. So I was so happy when I came home from therapy/acupuncture this week and found another beautiful bunch of flowers from the same friend. The flowers were waiting for me on the kitchen counter with a teddy bear wrapped around the vase, and the note said the intention was that I would enjoy what I missed the first time around.